1954 MG TD. That's right one of the richest men in the world, more importantly the man who has defined American clothing style for more than 50 years began his love affair for cars with a 1954 MG TD owned by his brother. While on a flight for a business trip, I had the opportunity to catch up on reading past issues of AUTOWEEK Magazine. The December 3, 2018 issue has an excellent story on Ralph Lauren's incredible collection of the world's finest automobiles. Lauren, born Ralph Lifschitz (I am not kidding, that is his birth name) did not come from a rich European family but from very humble New York beginnings. Growing up he didn't even own a bicycle, there was no way he could have conceived owning one of the world's finest collections of rare automobiles. As a young man, his first introduction to "exotic" cars was when his brother bought a 1954 MG TD. He also recalls staring in to the front window of Fergus Motors showroom in Manhattan, at the Morgans. 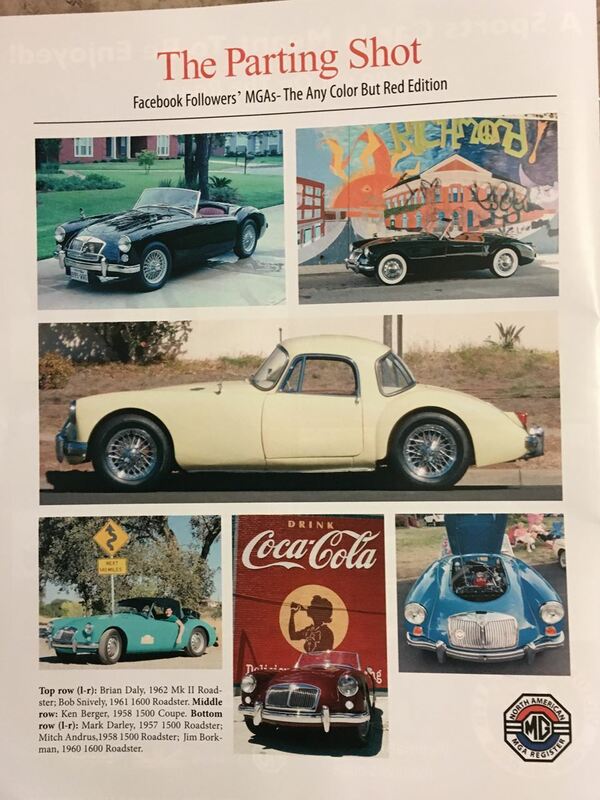 According to the article, When Lauren was first getting started he couldn't afford much, but he bought a 1961 Morgan, British racing green with a leather strap across the bonnet. He is quoted "It said something to me...it went with my style." Even though Lauren own's everything from 1938 Bugatti Type 57SC Atlantic to a McLaren F1 LM to Ferrari's, Porsche's and Mercedes, British cars hold a special place in his heart. And yes, he does have LBC's in the collection. Go figure, once again MG's are at the heart of all things automotive. 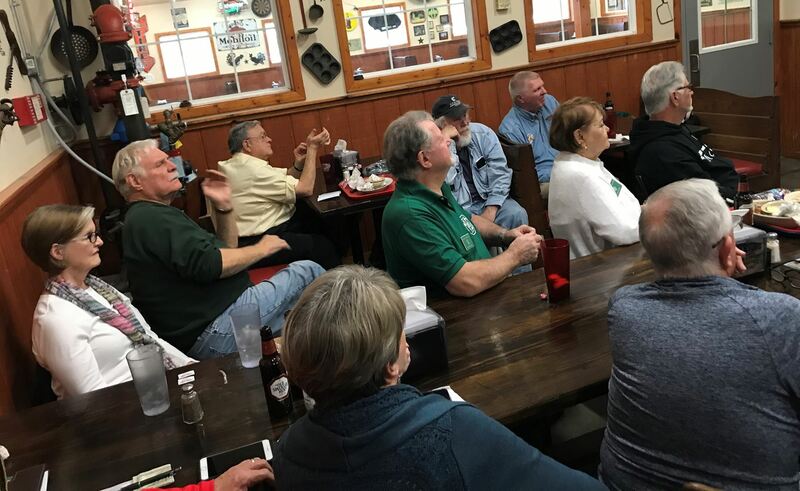 The February monthly meeting was another smashing success as we received an update on the activities of the Houston Jaguar Club. We have dedicated this year to strengthening the bond between the members of the Houston area car clubs that have a love for LBC's. That is Little British Cars for those of you who may be reading this and haven't been initiated into the passion. The presentation was made by Keith Ryder, a long time member and friend to the HMGCC. Club members are paying close attention to what Keith has to say! President Woodward, is this new club regalia? 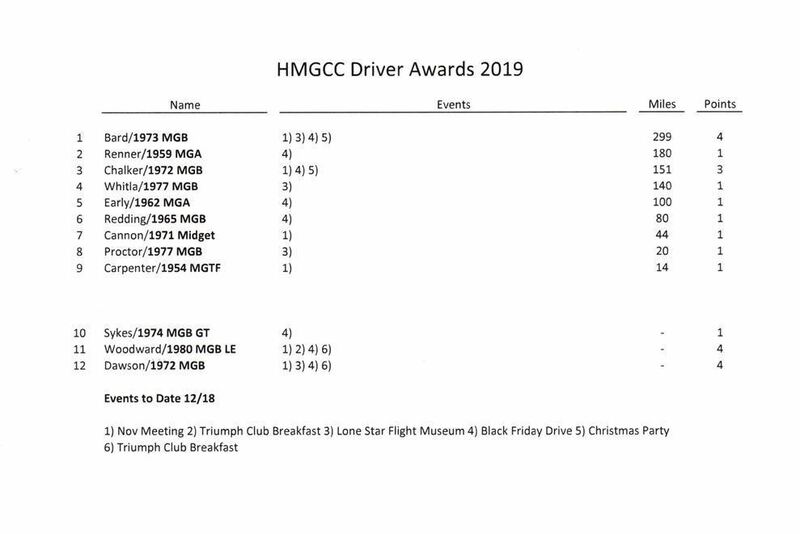 Below is the current standings for the drivers award. Thanks as always to Greg for keeping up with this. Our tech session on Saturday, January 19th was only worthwhile if you love and care for your MG and would like to keep it looking marvelous. 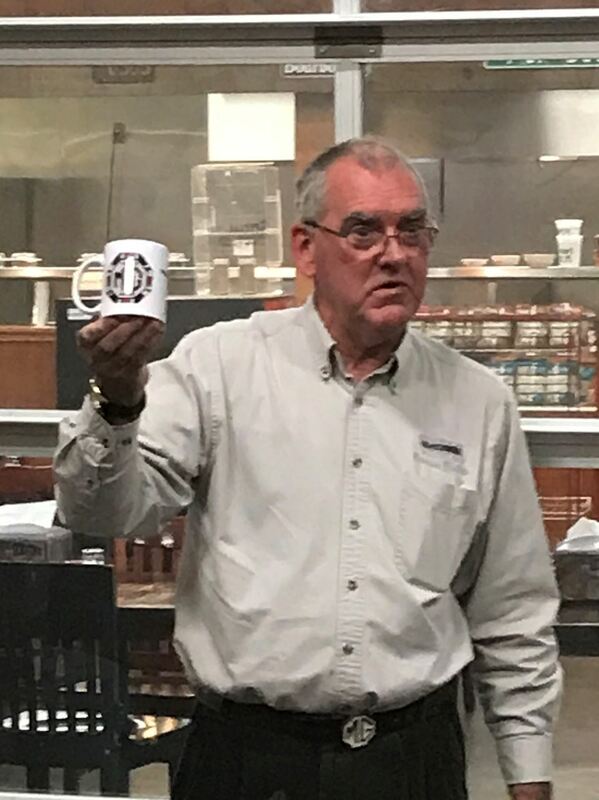 The event with owner John Gray at Gulf Coast Auto Shield was the most advanced and useful session on auto paint maintenance and preservation that most of us had ever attended. 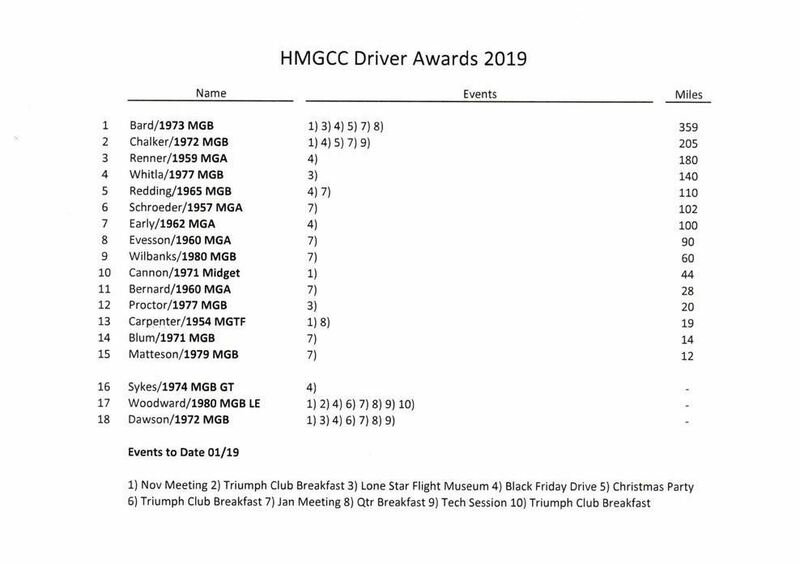 A few members of the Jaguar club joined 10 or so HMGCC members for a detailed and generous sharing of tips, tricks and recommended products in support of the subject. John is very well-informed in this narrow niche of car maintenance and he talked at length about the methods, tools and materials needed to do it right. The clear shine on the 15 or so high-end customers’ autos in his shop, including a newish McLaren, was testament to the quality of his efforts. The pinnacle of service in this shop is the application of a ceramic finish that protects the paint job like nothing else can. Some products will even self-repair scratches with the heat of the sun. Though the cost of this protection is not insignificant, it must be very satisfying when the best outcome is desired on a precious vehicle. Use 2 or even 3 water buckets when washing the car. Use a “grit guard” at the bottom of the bucket to minimize the application of grit from the bucket onto your paint job. Wash your wheels first and never expose your paint to wheel water or wash rags. Wheel debris does a nasty job on fine paint. Use the various available microfiber cloths for drying, polishing, etc. Use a detergent especially for microfibers to wash used cloths, though some experts say use a cloth once and THROW IT AWAY. One surprising tip was to use a 50/50 solution of 91 percent alcohol and water before waxing to clear any previously applied and remaining wax. Endless practical tips for cleaning interiors, glass and tires were also given. Lots of information was provided on the need for a quality, long-throw, random orbital buffing machine. Trox was one name we saw; Porter-Cable was also cited as a worthy brand among others. We watched and participated in the use of a power machine and cleaning materials on the trunk lid of a late model Bentley. It looked basically clean to start, but the professional efforts rendered results that you could not only SEE but FEEL. January/February 2019 issue of MGA! Magazine (upper left). The following article was posted on Facebook by J. C. Hackett. We have no idea who he is but he did ask that this be shared and it is sage advice on car show etiquette. While most people who attend car shows are kind and considerate, a small percentage are not. They will do things that annoy or insult car owners, belittle their hard work, or even damage their vehicles. No one wants scratches on the car they spent HOURS polishing to a high gloss. The trouble is, most of us have said or done something that qualifies as being rude without realizing it or meaning to. So give the following a look and make sure your not "That person." Seriously – don’t touch the cars. Don’t reach out and put your hands on it. Don’t accidentally brush it with your coat or bag as you walk by. Don’t back into it while you’re trying to take a photo of another car. Don't rub against it as your trying to squeeze between two cars. Don't touch unless your naked. Zippers, snaps, buckles, rivets, watches even fingernails can and will scratch paint. Bringing a kid to a car show is wonderful thing, but your kids are your responsibility. They shouldn’t ever touch cars, throw toys that hit cars, sit in cars, sneeze on cars, stick their heads into cars and drip snot on the seats, etc. Don't let them throw dirt, rocks, toys, etc. Some people don't mind if the kid gets in the car but make sure it is okay before your kid climbs on or in a car, most people don't want fingerprints or candy stuck all over their car. You just spotted a terrible show car. It’s sloppy. It’s ugly. It’s not even clean. You roll your eyes, make snide comments, chuckle, tell your buddy what’s wrong with it, and move on. Here’s the thing, someone in the world loves that car like a member of the family. They don’t see the problems, the dirt, or the fact that it’s downright hideous. They see a beautiful machine worthy of endless attention…and they don’t need your disrespect. The same goes for the newer cars. It doesn't have to be 40+ years old to be beautiful, fast, expensive, have a lot of work into it. Not everyone can afford a show car and a driver or they love their car so much they prefer to drive it all the time. 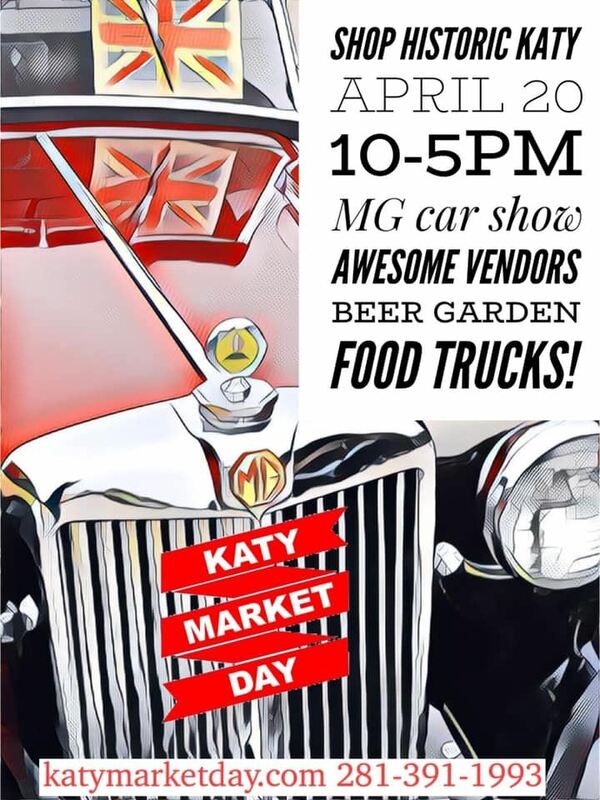 Unlike some, they made a big effort to come to the show, paid the entry fees, spent their time to do things to their ride, spent hours cleaning and polishing (or maybe not, you rat rod guys know what I mean) and subjected themselves to the public eye. They don’t deserve to hear trash talk…so if you can’t say anything nice, just don’t say anything. Maybe they are just getting started and wanted to show what they have started with or the mods they have done so far. Not everyone has a $200,000+ show car build by so and so. We all start somewhere. There are always automotive photographers at cars shows, always someone that wants to get a picture of some nice ride. Some are there for fun and some are earning a living, news paper, magazine, etc. Don’t just ignore the photographers because you want a better look. Be polite and look around often and check that you aren’t messing up someone’s shot. Just as importantly, don’t walk into someone else’s shot. This is more true now with the high quality cameras built into phones so pay attention to your surroundings. I see this a lot and deal with it a lot myself, it's not easy getting a clean shot. If your showing your car, don't crank your stereo. Some people enjoy the music already playing by the DJ or Announcer. They also want to listen to any information, door prize give away, contests, problems etc. that might come across the loud system. If your blaring you bazillion watt stereo, no one can hear it. Don't just leave your nasty rags, empty cleaner or detail spray bottles, soda cans, water bottle etc. Someone has to clean up after the event, most times it is the person that had to get there two hours before the show to set things up. They are hot, tired and ready to go home too. Very important, no matter what you think of the other cars, remember that a lot of hard work, blood, sweat and tears have gone into them. Someone has spent their hard earned money, time away from family or with someone special that might not be around anymore. In the end, we all share a passion about cars, we are all the same at the core. In the end, a little common sense and courtesy goes a long way to helping everyone enjoy the show. Hope to see you there! 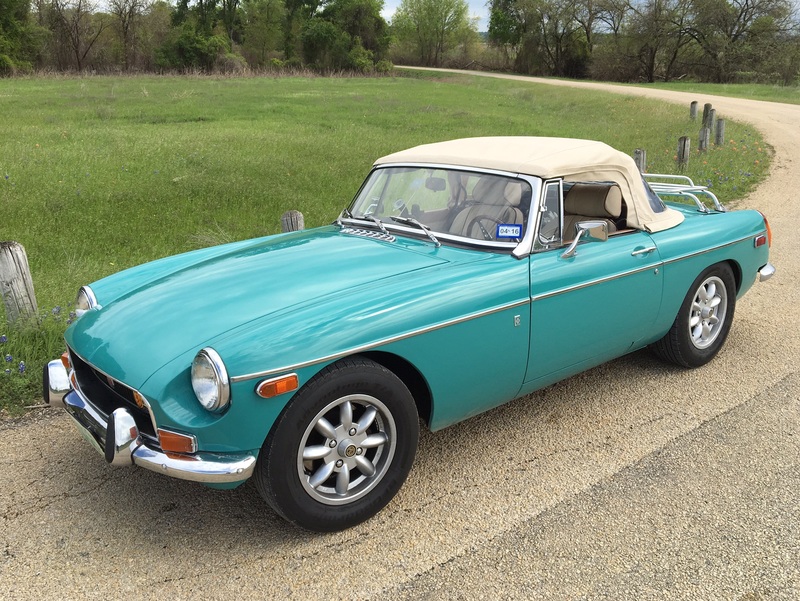 When I made the decision to put a cream colored vinyl top on my MGB, I knew that my nemesis was going to be dirt and that keeping it clean would be an ongoing battle. Up until a couple of weeks ago I had been successfully winning the battle— that is, until I ran into an army of bugs on the way home from the GOF in Waco. Upon arriving home, the top had several bug splats, most of which were easily removed with a combination of soap and water, vinyl cleaner, and a little elbow grease; except one, which was a brilliant baby poop yellow. It wasn’t very big, but because of its color and location right dead in the middle, it drew your eye right to it. Beyond the cleaning methods already mentioned, I tried just about everything else, even mineral spirits and a lacquer thinner. I bought some expensive cleaner from Amazon that had a 4-1/2 star rating and rave reviews. Nothing worked. In fact, it was getting worse as my efforts just seemed to spread the stain. I was reaching the point where I thought I was just going to have to accept the fact that the top would be discolored. Then I had the most brilliant of ideas: ask my wife Kim. She’ll know what to do. She is the master cleaner. She cleans everything in our home. So I trooped into the kitchen, taking off my shoes at the door because she had just cleaned the kitchen floor, and with sadness in my voice shared with Kim my dilemma. She didn’t hesitate. “Did you try coconut oil?” Coconut oil? Who would use coconut oil to clean a car’s vinyl top? Well, without much expectation of success, I asked Kim if she had any coconut oil, which, of course, she did. As she handed me the jar, she said, “I use it all the time, even to clean the gummy residue on our suitcases from those stickers the airlines use.” Hmm, maybe she was onto something. So I trod back out to the garage with my spoonful of coconut oil and applied it liberally with my finger. As I rubbed it in, the oil began to melt and the bug guts started to come off as I wiped the area with a wet cloth. With that first application it didn’t get fully clean, but the stain lightened enough to give me hope. So I put on a second application and let it sit overnight. The next morning I was out in the garage very early, with my wet cloth in hand and expectations high. As I wiped it down, the stain was almost completely gone. One more application of the coconut oil and— success! You would never know that a bug gave up his life on my cream colored vinyl top. Since then I discovered it works well on my leather seats. Plus I found an article online noting that not only does coconut oil clean the leather safely it also is a natural conditioner. Like all new cleaners it is recommended that you try it in a inconspicuous place first. Coconut oil is my new favorite cleaner. I just hope Kim keeps the pantry in stock. 2019 is off to a great start with our first monthly meeting of the year. We had almost 40 people turn out at Moe's Irish Pub in Katy. So many people that Moe's staff had to add additional tables and chairs multiple times. The banger's and mash, fish & chips and shepherd's pie were brilliant and the conversation and energy was as high as it has ever been at a club monthly meeting. The warm temperatures and blue sky allowed many of us to drive our cars. We had several first time guests, including a few members of the Texas Triumph Register. (No, we did not make them park their cars in the back of the parking lot). 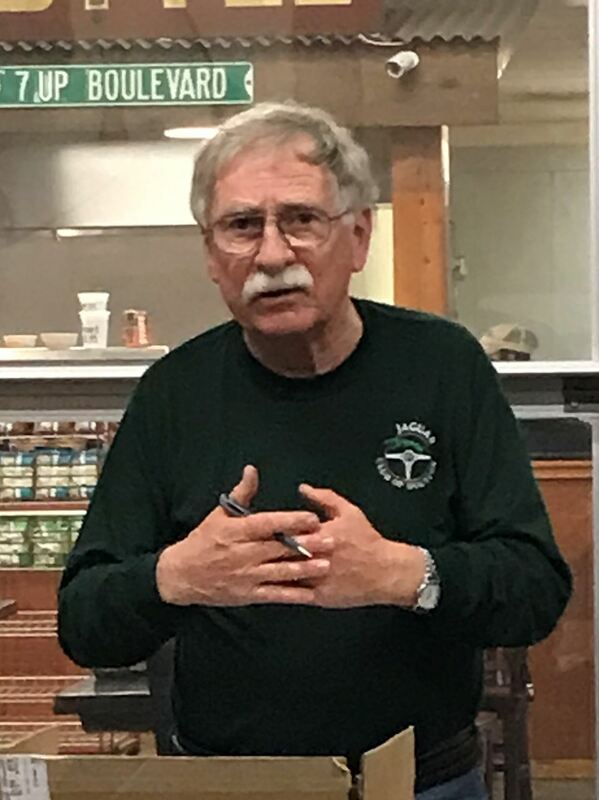 The highlight of the meeting was a report from Triumph Club Events Chair, John Blum, on their plans for 2019. In addition, President Mike Woodward reviewed our 2019 events calendar. Board Chairman Mike Gentry presented the new format for this year's awards program. Dwight Dawson had a selection of new club shirts available to purchase or order. Photos of the shirts can be seen in the December 15th post below. If you are interested in ordering a shirt go to the websites store or contact Dwight. They were very popular. A good time was had by all as demonstrated by the great conversation, laughter and tire kicking. So much so that we were honored to have three of the guests join the club bringing our club membership to over 110. Speaking of club membership, please don't forget to renew your membership. We still have 25 members who have not renewed for 2019. Please see attached standings as of December 2018. Thanks as always to Greg Fleischer for keeping up with all of these events.